So ‘socialist’ Jeremy Corbyn, after pressure from the trade union boys agreed not to make Trident an issue. After all, making nuclear weapons and the submarines that carry them, are jobs for the boys. Earlier Mr McCluskey said [the] Unite [trade union] was sympathetic to the argument that Trident nuclear weapons were expensive but added that not renewing the multi-billion pound system would cost some workers their jobs. Corbyn has done the same ‘deal’ over bombing Syria. And note that it was his ‘fellow’ Labour MPs wot done it. So, just how socialist is Jeremy Corbyn? OK, he’s anti-austerity, he’s against the privatisation of the NHS, key issues that got him elected and importantly, especially on the NHS and renationalisng the railways, he knows he has widespread support and these are not issues that are likely to split the Labour Party (especially ironic as how it was a Labour government under Blair/Brown that began the gutting of the NHS in the first place). 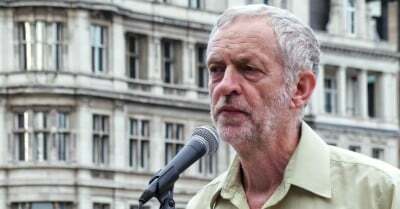 Jeremy Corbyn has a huge mandate from Labour members to oppose British bombing in the Middle East, a new poll showed yesterday. Results of a Labour List survey of 2,453 supporters found that 63 per cent support the party leader’s opposition to air strikes in Syria. – ‘Labour Party Backs Jeremy Corbyn against British Air Strikes in the Middle East‘, The Morning Star, 26 September 2015. I suppose it just shows how desperate we are for an alternative to the sociopaths in power that we pin our hope on a single individual who, on the surface at least, is closer to our progressive ideals than most. But just how close is he in reality and just how realistic is it to pin our hopes not so much on Corbyn per se but on a revitalized Labour Party as an alternative? Already, on several of his key election promises, he has had to back down. Won’t the lefties here get real and accept the fact that more than 90% of the Parliamentary Labour Party are opposed to Corbyn’s policies? He leads but by and large, in name only. By the time he has finished negotiating his way through the minefield that is Labour Party politics, he’s going to look like that cat in the MGM cartoons after the Road Runner has finished with him, with very little of his campaign promises, or his hide, left. On reading those lefty/liberal commentators who have jumped to Corbyn’s defence, or rather defence of their misty-eyed view of the Labour Party as a vehicle for change, it strikes me that there is an awful lot of wishful thinking going on judging by the central issue that crops up again and again, namely returning the Labour Party to its allegedly socialist roots by one means or another. Now no doubt Barnett is a decent individual as well as being an excellent journalist but does he really believe that the Labour Party can be redirected to “challenge the individualism, corporatism and privatisation of society overseen by today’s monstrous elite”? Is it any more likely to happen than it is to try and recreate the Labour Party of the 1940s? This is wishful thinking on a grand scale and hinges on the central issue; can the kind of society Barnett, Corbyn, that many of us want to see, be achieved through our Parliament and specifically, through a Labour government? Our current Tory government is more accurately described as a regime as it governs with only 24% of the vote, less than a quarter of the electorate due to our rigged voting system. What is the likelihood of Parliament restructuring itself, by itself? Look at how it handled the exposure of the many MPs’ criminal activities in defrauding the public by fiddling their expenses. Yes, some reforms were enacted, a couple of MPs even did some time but the whole farce is still overseen by Parliament. The fox is still in charge of the henhouse. The British state has been around so long, even if most of its history is fake eg, being the ‘first democracy’, that genuine reform is impossible, and more importantly, irrelevant. So, what he seems to be saying here that the way to ‘democratize the state’ is through extra-Parliamentary means which if true, means that the Labour Party is pretty much surplus to requirement anyway. What Barnett and many like him refuse to accept is that the Labour Party is part of the state and essentially, has been so since it accepted the Parliamentary road to- well whatever, socialism if you like, back in 1910 or whenever it was. But why spend all that energy on trying to ‘reform’ the Labour Party when such vital energies would be better spent creating this new ‘Open Party’ that he talks of. Let Corbyn resign and head up this new party, he has such overwhelming support. Or does he? Thus there’s a fundamental contradiction at the heart of Barnett’s argument, namely that it sees the state, in the guise of a Labour Party or indeed a Labour government, reforming itself in order to abolish capitalism? It’s a fantasy. Any future Labour government, just like Syriza in Greece or Podomos in Spain, will have to contend with an all powerful international capitalist elite, that thinks nothing of destroying entire economies let alone entire countries. How many, do you think, of Corbyn’s ‘reforms’ can survive into this mythical future? At best, it’s just a rehash of the old ‘lesser of two evils’ position that many on the left have been conned into supporting, including myself. At worst, and this I think is crucial, it could well lead to an even more cynical public when they see that this new Emperor too has no clothes.